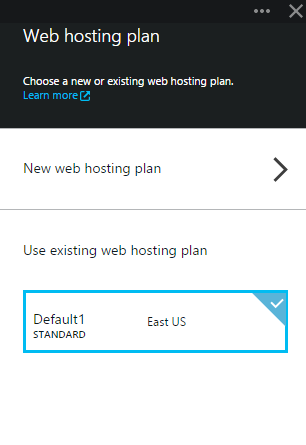 I've got several websites in azure, and they are now grouped into "Web Hosting Plans". I have two plans total. What I'd like to do is move the sites from one plan into the other. Is there a way to do this without removing the sites and recreating them? Here are the Azure Portal steps on March 2015. Note: This will only list destination App Service Plans that are in the same Resource Group. 3) Scroll down list, select "Change App Service Plan" in group "App Service Plan"
Azure Standard Web Application Plan, several websites? How to set up an A-record for Azure hosted website / web role? ?Can I host a MVC3 website on an Azure Web Site or I need to create a Cloud Service? Is there a way to view deployed files in Azure?